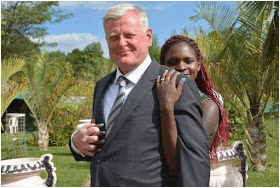 Agatha Jeruto, a 21-year-old Kenyan athlete recently said ‘Yes I Do’ to a 44-year-old Mzungu from Norway. The two walked down the aisle in a private wedding which was held at Poa place in Eldoret. They wedded a couple of weeks ago but many people didn’t know about it and they are currently enjoying their honey moon in Europe.